Summer Gravity Camp Mt Buller is all about you becoming a smoother, smarter and faster rider plus having fun and meeting new riders. Would you like to get to the bottom of the hill faster, hit smoother lines and/or take seconds of your race time then this is the gravity skills camp for you. Learn from qualified and experiences coaches that will provide you with the how to of skills, hints and tips to create flow on any trail. Our trained eye for detail means you will receive instant feedback to progress your riding, to be efficient and create confidence. Mt Buller Bike park trails offer perfect terrain to learn on with the added bonus of a shuttles to spend more time descending. This action packed all inclusive weekend will give you the edge to ride trails with confidence leaving you wanting more and most of all leave you mates eating your dust. 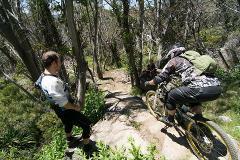 Bring your hard tail and get your pump on, a great skill to enhance your downhill riding skills. All riders looking to gain confidence in the descending ability from cross country, trail, enduro and downhill riders. No matter what discipline of mountain biking your do we will make you a stronger rider on descents. Not just for males, we also cater for women. Learn how to pick track lines, reading the terrain to maximize speed. Skills Instruction on riding Corners, Pumping, Pedalling, Drops, Jumps, Rock Gardens.